Focused on creating an inviting retail space, owner/operator Rose Alexander has taken the elements of the geisha and translated these into the material forms of beautiful paint, pattern and colour. Drawing on her unique style and attraction to oriental art, Rose is able to guide and instruct on painting skills and techniques utilising her professional qualification as a visual artist. 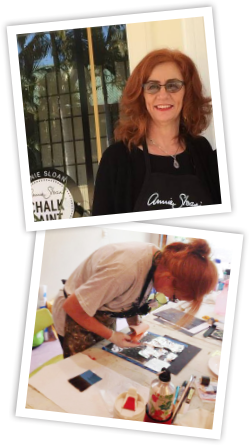 Her dream is to create a community of painters who will inspire others to create their own statement pieces and enjoy the pleasurable rewards that this achievement can bring. Dragon Design Studio is the creative label authenticating Gaysha's signature style and the oriental art centred pieces that Rose designs and produces herself. Always original work and perfectly unique, Dragon Design Studio furniture showcases several styles and techniques, which can be demonstrated and are taught at the onsite studio workshops. Dragon Design Studio embodies creativity and upcycling of vintage and retro items and the potential transformations achievable with Chalk Paint®, stencils and reloved furniture.